Can a Toshiba Satellite 205CDS be upgraded to accept a WiFI card? Hardware wise, it might well happen, but you need OS support as well. Maybe any device you get will not support windows 95. You'd then need to upgrade to XP or something newer than 95, anyway, but your machine might not have the juice to run that. 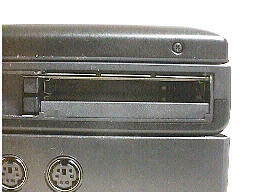 Directly above the slot itself (which is on the left side of the machine, if that matters), it has an very small sticker-icon of a "card" with the letters "ZV"
Not a spare one, no...would an ethernet adaptor require the PCMCIAS slot mentioned above, or would it go inside the machine? Toshiba gave me the spec sheet for 200CDS instead of 205CDS..
Anyways, that sheet says you have a Type III PCMCIA slot that supports 5V cards. So a 5V wireless PCMCIA adapter ought to work. You have to look carefully what drivers you have available though. There are less and less devices out there that have support for Windows 95 or 98. Instead of buying a wireless adapter only to find out it doesn't work you could take that lappy to a computer (repair) shop and try things out (just plug in the card and see if Windows detects it) before buying.